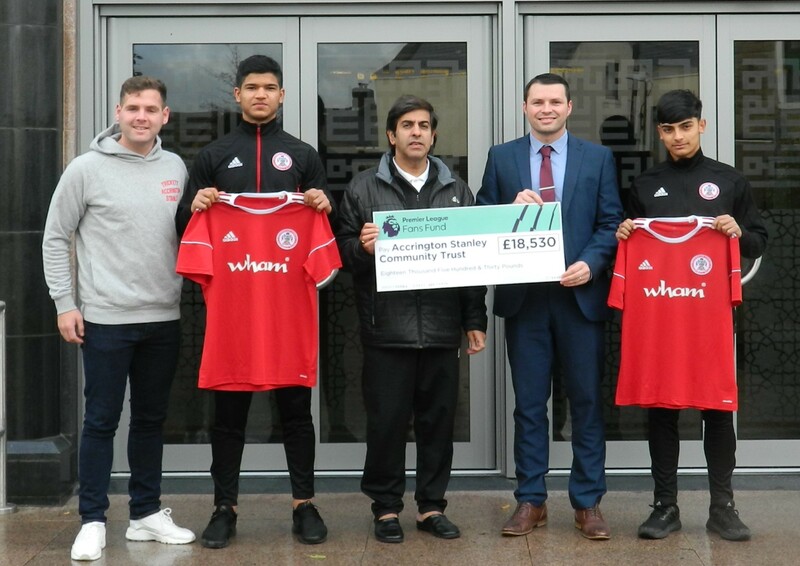 Accrington Stanley Community Trust have unveiled a new community scheme to enhance their engagement with their local Black, Asian and minority ethnic (BAME) community. The ‘Stanley Together’ project, will see the creation of a new BAME focused fan-group and several outreach fan-engagement programmes. The Trust will work with local schools, community centres and Accrington’s new £9million Raza Jamia Masjid mosque to deliver a range of workshops to educate them on the history of Accrington Stanley FC and inspire them to attend matches at the Wham Stadium. From left to right: Billy Kee and Zehn Mohammed (Accrington Stanley FC), Purves Ali (Trustee – Raza Jamia Masjid Mosque and Accrington Stanley Community Trust), Martin Fearon (CEO – Accrington Stanley Community Trust), Kasom Shah (Accrington Stanley U18 Captain). The project has benefited from a £18,530 grant from the Premier League Fans Fund, the investment of which will also enable the Community Trust to extend their existing Junior Redz young supporters’ scheme, improve their pre-match fan zone and support the upskilling of a cohort of volunteers. The ‘Stanley Together’ project is the latest stage of a new long-term fan engagement strategy at Accrington Stanley FC, which included the development of a brand-new 1,100-seater family stand, which is due to be fully operational in December 2018.